On an expedition to the Antarctic Peninsula, one woman was fortunate enough to find herself in a cozy encounter with a very friendly local. 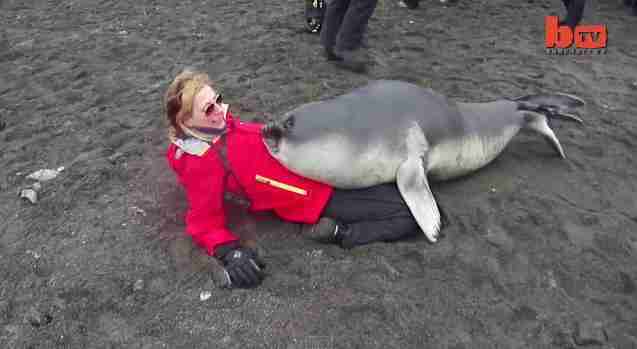 Charlene Fritz was among fellow tourists on Snow Hill Island when she was approached by a curious young elephant seal who clearly wasn't shy, as Barcroft reports. The pudgy baby, weighing in at around 200 pounds, promptly picked Fritz to be the lucky recipient of his blubbery snuggles. 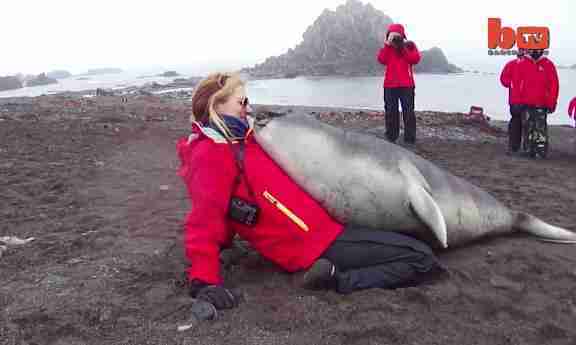 For a few memorable moments, the seal cozied up on her lap, at one point even craning his neck up as if to steal a kiss. If the pup seems overly eager for affection, there might be a reason. Elephant seals are reliant on their mothers for only about twenty-eight days, and then they're usually left alone on the beach until hunger inspires them to venture out on their own for food. Fritz, to her credit, handled the situation like a fine ambassador for humankind - she did not directly touch or approach the pup but rather peacefully accepted the assertive little seal's curious cuddles on his own terms.